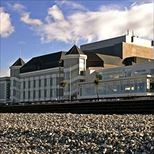 Venue Cymru is around a 10 minute walk from both Llandudno train station (West Coast Main Line) and Llandudno Town Centre. If you are exiting Llandudno station, take a left and follow Vaughan Street, continue to merge onto Mostyn Broadway. From here, continue down Mostyn Broadway and Venue Cymru will be on your left-hand side, just past Llandudno Swimming Centre. Several bus services pass right outside the rear of Venue Cymru (In front of the car park): 12 - Rhyl Bus Station - Regular service running approx every 10 minutes, Monday-Saturday. Limited service on Sunday. 5 / X5 - Bangor - Regular services running approx every 20 minutes until 6pm, then approx every 60 minutes, Monday-Saturday. Limited service on Sunday. X1 - Blaenau Ffestiniog - via Llanwrst & Betws-y-Coed - Regular service running approx every 60 minutes, Monday-Saturday. Sunday service running at approx every 3 hours. Venue Cymru operates a Pay and Display car park at the rear of the building, with designated disabled parking bays to the left of the main entrance. Parking is also available on the Promenade which is also Pay and Display until 4pm, to which then it is free of charge. Accessible Parking: There is a dropping off point at the main entrance with plenty of room to disembark safely. In the car park at the rear of the building (Mostyn Broadway) there are 18 designated disabled parking spaces; parking is free for disabled badge holders within these spaces. Infra-red & induction loop hearing systems. If you'd like a receiver for our infrared amplification system, just ask at our cloakroom. Our season brochures can be provided in Large Print, Audio CD format or Braille. Assistance Dogs: If you have an assistance dog, please advise Box Office at the time of booking and they can then allocate the most appropriate seating for you or make adequate provision to care for your dog during the performance. Accessible Facilities: Accessible toilets are available on all levels in both our Theatre and Conference Centre Accessible performances: Audio Described Performances Audio-description in theatre is a live verbal commentary delivered between the dialogues on the visual elements of a production as it unfolds. The description gives only the essential information that a visually impaired patron might miss. Touch Tour For most audio-described performance we do, we have a Touch Tour that precedes the show. Our Touch Tours allow visually impaired patrons the opportunity to familiarise themselves with the set, props and costumes. BSL Interpreted Performances A number of performances and events are British Sign Language interpreted. Our Box Office team can advise the best seating to take advantage of this offering. Captioned Performances Captioning is similar to television subtitling and gives deaf, deafened and hard of hearing people access to live performances. The actors' words appear on a display unit at the same time as they are spoken or sung. Speaker names, sound effects and off stage noises are also shown. Relaxed Performances Are specifically designed to welcome people who will benefit from a more relaxed performance environment, including people with an Autistic Spectrum Condition, sensory and communication disorders, or a learning disability. We aim to make the events as inclusive as possible for families so they are open to all, even if you don't need the adjustments we make for relaxed screenings. There is a relaxed attitude to noise and movement and some small changes made to the light and sound effects, we'll keep the lights on low and turn the volume down slightly. Dementia Friendly Screenings For people with dementia, memory loss and their family, friends and carers but is open to the general public. The screenings have a relaxed atmosphere so that people are welcome to move around and come and go as they please. Each screening includes an interval with live entertainment. * Please note that pastoral care is not provided at these events. A friend, family member or carer must also attend.